Peng Zu is the newest dining experience at Suncoast Hotel & Casino, located along the casino’s wall of restaurants across from Du-Par’s. A casual Hong Kong and Shanghai noodle shop atmosphere is evoked via a bright and cheerful design with 50 eye-catching authentic, screen-printed parasols from China suspended overhead as a ceiling feature and a wall-to-wall custom art installation designed with imagery and symbolism representing joy, longevity and good fortune. In keeping with the moniker of the restaurant, which is named for the legend of Peng Zu – a figure said to have lived more than 800 years – the venue encompasses the inspiration of using cooking, herbs and spices to promote long life and good health. Asian fare comprises the menu with appetizers, soups, wok-fried specialties, noodles, house specialties, rice, vegetables, combination specials and desserts. Peng Zu is open daily for dinner from 4 p.m. Dinner nightly. Peng Zu, Suncoast Hotel & Casino, 9090 Alta Dr., Las Vegas, NV 89145, 702-636-7111. Eureka! has debuted in the Emergency Arts Building within the Fremont East District in downtown Las Vegas. The 23rd location in the Eureka Restaurant Group’s collection and the first in Nevada, the restaurant offers seating for 170 diners, an outdoor patio and a space filled with industrial and modern touches. The menu features American classics and all-natural Angus burgers matched with an all-American beverage program with 40 craft beer taps, more than 40 American whiskeys and classic cocktails. Menu highlights include Polish sausage corn dogs; a bone marrow burger with bone marrow shiitake butter, charbroiled onion and horseradish mustard aïoli; skirt steak with grilled broccolini, red chimichurri, chili flakes and Parmesan; and bourbon barrel cake with pecans, caramel and vanilla bean ice cream. Eureka!, Emergency Arts Building, 520 E. Fremont St., Las Vegas, NV 89101, 702-570-3660. Flock & Fowl, a popular eatery by Sheridan Su and Jenny Wong known for its “perfect plate of chicken rice,” has opened its second Las Vegas location. Situated on the ground floor at The Ogden, a 21-story high-rise downtown, in the space formerly occupied by Itsy Bitsy Ramen & Whisky, the new 2,500-square-foot spot features an expanded menu and longer hours. In addition to its staple Hainanese chicken rice with house-made chili sauce, dishes include kaya toast with Southeast Asian coconut egg jam, curry laksa coconut noodle soup with prawns and chicken, broccoli and quinoa salad, and black cod with Thai corn chowder, confit potatoes and truffle oil. The new eatery is open Sun.-Thur. from 11 a.m. to 11 p.m. and till midnight on Friday and Saturday. The original location on W. Sahara is closed for renovation until late February. Flock & Fowl, The Ogden, 150 N. Las Vegas Blvd., Ste. 100, Las Vegas, NV 89101, 702-983-4880. Chef, author and TV personality Giada De Laurentiis has opened her second restaurant, Pronto by Giada, at Caesars Palace. It is her second eatery on the Vegas Strip, joining Giada across the street at The Cromwell. It is located in the former Payard Patisserie & Bistro space adjacent to Bacchanal Buffet and MR CHOW and offers breakfast, lunch and dinner options. Expect pastries, sandwiches, made-to-order smoothies, paninis, salads, antipasti, formaggi and salumi platters, gelato, sorbetto, cookies, cakes, an extensive coffee program, wine on tap and cocktails. Pronto by Giada, Caesars Palace, 3570 Las Vegas Blvd. S., Las Vegas, NV 89109, no phone. Americana is now offering an all-you-can-eat butler-style brunch every Sunday from 11 a.m. to 3 p.m. A wide selection of chef/owner Stephen Blandino’s signature creations is served, including Merlot-poached pear tartare with red flame grapes and oak leaf lettuce; eggs Benedict with short rib; spiced lemongrass mussels; chocolate chip pancakes with toasted meringue and chocolate sauce; carne asada fries with flat-iron steak and melted cheese; chicken and waffles with bourbon maple syrup; grilled portobello with chimichurri; and ricotta and fig toast with strawberry balsamic and arugula. The unlimited brunch is priced at $42 per person, and bottomless mimosas or Bloody Marys are an additional $17. Americana, 2620 Regatta Dr., Ste. 118, Las Vegas, NV 89128, 702-331-5565. Chef Thomas Keller's Bouchon at The Venetian will pay tribute to legendary chef Paul Bocuse, who passed away on January 20 at the age of 91, with a tribute menu. Available March 1-4 and priced at $95 per person, the dinner will include soupe aux truffes noires V.G.E. (truffle soup), a dish Bocuse originally served to French President Valéry Giscard d'Estaing at the Élysée Palace on Feb. 25, 1975 when Bocuse received the Chevalier de la Légion d’Honneur, the highest decoration in France; filet of beef with seared foie gras, Madeira and truffle sauce with seasonal vegetables; and dessert of apple tart with vanilla ice cream. Bouchon, The Venetian, 3355 Las Vegas Blvd. S., Las Vegas, NV 89109, 702-414-6200. Ferraro’s Italian Restaurant & Wine Bar is now offering a late-night Mezzanotte prix-fixe menu of small plates served from 11 p.m. to 2 a.m. in the lounge and on its al fresco patio. Priced at $25 per person and available for dine-in, pick up or delivery, the four-course menu includes a choice of fried quail lollipop, burrata cheese, classic Caesar salad, pasta e fagioli soup, fettuccine or spaghetti; main course of seared five-oz. chicken breast, grilled five-oz. salmon or tripe in a spicy tomato broth; and dessert of tiramisu cannoli duo. In addition, wines are 50 percent off (excluding red-marked collections) and specialty drinks and à la carte dishes on the Mezzanotte menu are all offered at 25 percent off the regular price. Ferraro’s Italian Restaurant & Wine Bar, 4480 Paradise Rd., Las Vegas, NV 89169, 702-364-5300. Park on Fremont in the Fremont East District in downtown Las Vegas has introduced a specialty menu of bourbon flights. The menu features three flights, each selected based on aroma, palate and finish and consisting of three one-ounce pours of varying bourbons. The first flight tier includes Angels Envy, Woodford Reserve and Basil Hayden, priced at $32; the second small-batch flight includes Four Roses, 1792 and Col. E.H. Taylor, priced at $29; and the final rye flight includes Bulleit 95 Rye, High West Double Rye! and Templeton Rye, priced at $27. Park on Fremont, Fremont East Art District, 506 E. Fremont St., Las Vegas, NV 89101, 702-834-3160. Throughout February, Bazaar Meat by Jose Andres at SLS Las Vegas will offer a truffle tasting menu featuring a 12-course tasting of dishes complemented by black truffles. Priced at $150 per person, courses will include dishes such as pan con tomate—Catalan-style toasted pan de cristal with fresh tomato and shaved truffle; black truffle barquillo made with chestnut, celery and mascarpone cheese; Vittore 1950 made with a tenderloin of Washugyu beef, black pepper, parmesan and croutons; and truffled Shabu Shabu de Toro—thinly-sliced bull sirloin poached tableside in jamón and truffle broth with Honshimiji mushrooms. In addition, guests may request truffle shavings on any dish for an additional charge of $25 per two grams, or $50 per four grams. The full truffle tasting menu is available for view online. Bazaar Meat by Jose Andres, SLS Las Vegas, 2535 S. Las Vegas Blvd., Las Vegas, NV 89109, 855-761-7757. John Church has announced he will be leaving his executive chef role at Aureole to take the corporate chef position and become head of culinary development for Golden Entertainment. One of his first tasks in his new position will be revamping the Stratosphere’s restaurants, including Top of the World, and creating a pub and a steakhouse at the casino/hotel just north of the Vegas Strip, which was recently acquired by Golden Entertainment. Church will also be rebranding the culinary programs at other restaurants in Golden Entertainment’s holdings, which include PT’s, Arizona Charlie’s and casinos in Pahrump, Nev., Laughlin, Nev. and Flintstone, Md. Church has been at Aureole in Mandalay Bay since 2016 and before that had worked at Andre’s, Alize, RM Seafood, Eiffel Tower Restaurant, AJ’s Steakhouse, MTO Café and Artisanal Café. 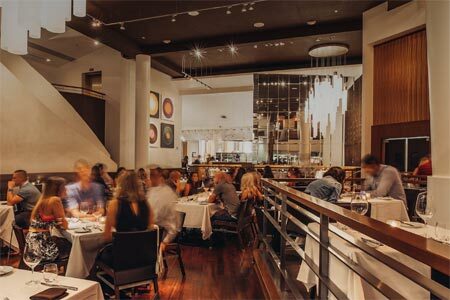 It has not yet been announced who will be replacing him at Aureole. Aureole, Mandalay Bay Resort & Casino, 3950 Las Vegas Blvd. S., Las Vegas, NV 89119, 702-632-7401. Wolfgang Puck’s Spago is relocating across the street to the Bellagio, opening in summer 2018, replacing Todd English’s Olives, which closed January 13. The new venue will feature an open-air patio, brass fixtures, smoked-oak wood floors, modern art pieces, a neon light fixture and floor-to-ceiling glass windows providing views of the iconic Fountains of Bellagio. The globally-influenced seasonal fare will include Puck’s signature touches, such as gourmet pizzas topped with salmon and caviar, a multi-course California tasting menu, special bar menu of Wolfgang Puck favorites, an artisanal cocktail program and extensive international wine list. Spago, Caesars Palace, Forum Shops at Caesars, 3500 Las Vegas Blvd. S., Las Vegas, NV 89109, no phone.